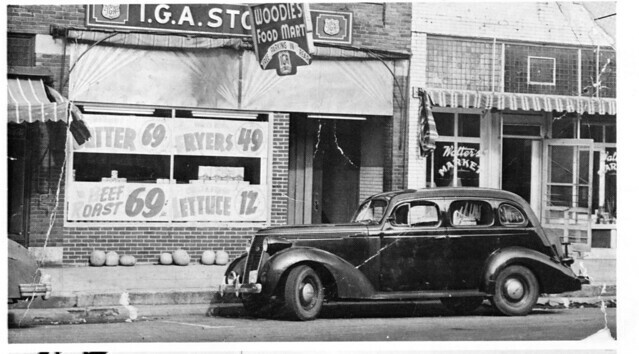 Woodie Schramm came to Bremen from Warsaw in 1944 and bought the Home Cash Grocery from Lester Koontz. In 2014, Woodie’s son Charles gave a History Chat talk at the Bremen History Center on the history of the business and provided photos and additional information incorporated here. Our thanks to Charles and all the folks at Woodie’s! Click the right and left arrows on the image below to see a slideshow of Woodie’s photos and newspaper clippings. Click in the middle to see the image in the Historic Bremen Flickr account. The business Woodie Schramm bought in 1944 is much older than you might think. Around 1876, Frederick Ponader (1845-1914), a carpenter recently emigrated from Germany, opened a bakery and restaurant on E Plymouth street in a large frame building where the stone-fronted Mutti building now stands (Bremen Family Martial Arts and the Masonic Temple). By 1885, he’d added a grocery and then dry goods, building a business rivaled only by J R Dietrich’s department store across the street. His sons joined him, and he passed the business on to them in 1909. Theodore (1879-1932) [photo] took over alone in 1913. He sold the store to Universal Stores in 1919 but bought it back in 1921. Foltz changed the name to E C Foltz & Co. He scaled back the business somewhat but continued to carry clothing and other items in addition to groceries. In 1932, the Ponader building burned down. Foltz soon reopened as a grocery in a building on W Plymouth St.
Lester Koontz bought the store from Ervin Foltz in 1943. He called it “Home Cash Grocery”. This is the business and location that Woodie Schramm bought in 1945.